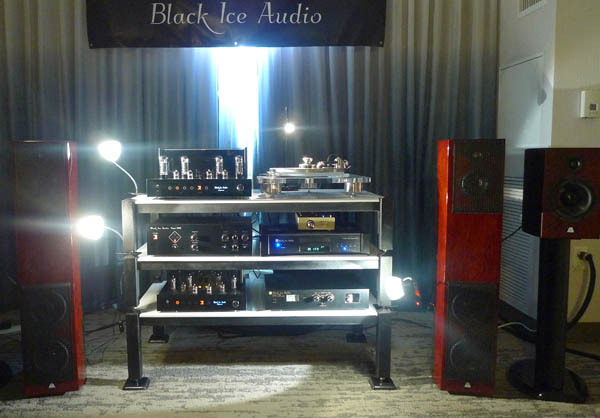 Today, in the room sponsored by retailer Underwood HiFi, I discovered that Jolida has changed its name to Black Ice (which is something I’ve been afraid of since got my first driver’s license). I think Black Ice Audio is a more excitement-inducing name than Jolida. The first of their newly released products, the Black Ice Fusion F11 vacuum tube stereo integrated amplifier, employs EL84 tubes. It puts out 18.5Wpc and employs Jim Fosgate’s “Odyssey dual phase V-drive circuit.” I have no idea what that circuit actually is (A VFET drives a tube? Or . . . ? ), but the amp costs only $1399, and it sounded like something I should review. The second new product is also an integrated amplifier: the Fusion F35, a stereo tube amp that puts out 60Wpc and costs only $1999. I auditioned two Black Ice systems: one with Living Sounds Audio’s LSA-20 floorstanding speakers ($6000/pair), and one with stand-mounted LSA-10 speakers ($2500/pair). Both played big and full. There was also a Clearaudio Champion turntable with a Benz Ace cartridge. Would you believe me if I told you the sound—with both LSA speakers—was unusually spacious with lots of liquid gold tube-osity?